Google’s lightweight, versatile Calendar app runs across the web and multiple mobile platforms to keep our lives organized—but just how deep have you delved into the more advanced features that it offers? Read on to go beyond the basics of appointment scheduling and calendar colors to get more out of this powerful agenda-setting tool. You should always associate locations, even approximate ones, with your calendar events. Why? If you’re using Google Calendar on Android or iOS, you’ll get travel alerts through the magic of Google Now, so if you need to set off earlier then you’ll know about it. What’s more, your event will be illustrated in the Calendar app with the relevant map backdrop, giving you an at-a-glance reminder of where you’re going to be heading. Unless someone else has created the event, you can easily add location information. 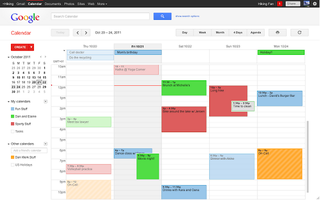 Getting your schedule aligned with someone else is often troublesome, but Google Calendar can help. First, you need to make sure you’ve invited all of the people who are attending in the event, then on the right of the event page you should see a link labelled Suggested times—click it to see times when all the attendees are free (based on their Google Calendars anyway). Alternatively, switch to the Find a time tab (next to Event details) to see everyone’s calendars side by side, and you can then find a slot where no one is busy. Note that you’re only going to be able to see other people’s calendars if you have been invited to them—it won’t work with private ones. Like many other Google products and services, Calendar has a Labs section where experimental features are tested out. On the web, you can find this Labs section by clicking on the dark cog icon to the right and choosing Labs from the menu that appears. One of the best experimental features currently on offer is a world clock. It enables you to see the current time in various time zones across the globe, and when you click an event you can see the associated start times. Use the Settings link to choose which zones are visible. Head into Settings from the Calendar app on the web, then click Calendars and choose any of the entries in the list. Under the Edit notifications tab you can set up a daily agenda email for your chosen calendar, delivered straight to your inbox at 5am in whatever time zone you’re in. Make sure you click Save to confirm. It’s a handy daily briefing to have if you’re not in the habit of checking through your Google Calendar as soon as you get up or on your way to work. You can enable or disable the agenda email for each of your calendars, if you want a heads-up for your working day but not for family events, for example. Quite a few of Google’s web apps now work offline in Chrome, but in most cases you need to manually activate the feature so that your browser knows to cache the relevant data when you don’t have an internet connection. To do this in Calendar, click on the cog icon for the settings menu and choose Offline from the list. Click Enable to confirm and heed the warning that this procedure will put certain bits of information on your computer—so don’t use it on a shared PC. The sync should only take a few seconds to complete. A new Offline tab is added to the Google Calendar settings screen that lets you choose which of your calendars are accessible offline. Hidden away in the Google Calendar settings on the web is the option to dim past events and ones in the future that are recurring. Click the cog icon then choose Settings to see the event dimming options, which you can enable or disable as you prefer (make sure you click Save to apply the changes). The aim is to focus on today’s events and the more important future events when you’re casting a quick glance at your calendar page—it makes sure that “the most important events on your calendar really pop” according to the official help page. Like a lot of Google products these days, Calendar can integrate itself into the company’s search engine (and thus Chrome omnibox) if you’re signed into your Google account while you use your browser. Try “make an appointment for 7pm” or something similar to see the event appear—you’ll then need to click Create event to confirm. There aren’t too many situations that spring to mind where you’d want to start adding to your schedule from Google.com rather than the usual Calendar app, but it’s good to know that the feature is here if you need it. A few other search strings work as well, such as “show my schedule”. You can find all sorts of interesting Google calendars out there on the web—your local sports team may well have one (if not, tell them to set one up) and Facebook allows you to export your upcoming events from inside your account. From cinema chains to churches, you can stay up to date with more organizations than you might think. Google lets you search for interested calendars from within the web app itself, but these are largely limited to public holidays for individual countries and sports fixtures. To find them, click the drop-down arrow next to the Other calendars heading on the left of the Google Calendar interface, then choose Browse Interesting Calendars. Some browser extensions are half-hearted attempts to cram web apps into tiny windows, but not so the official Google Calendar extension for Chrome made by Google itself. With a Material Design-esque finish and plenty of useful functionality, it’s well worth installing to give you one-click access to your schedule. You can of course see what’s coming up next on your calendar, as well as check the time until your next appointment and add new entries. If the web page you’re visiting has an event embedded in it, it can be added with a click, and you can right-click on the icon for quick access to your full calendar. It’s one thing knowing that Google Calendar probably supports keyboard shortcuts somewhere in the back of your mind and another thing actually making use of them to power your way through your schedule. If you want a comprehensive run-down of all the available keyboard combinations then consult the official list. Some of the best ones you might want to utilize are t to jump to today from wherever you are in your calendar and 1-5 to switch between the various views (day, week, month, custom and agenda). You can quickly create a new event with c and search your calendar with /. The s key brings up the calendar settings.